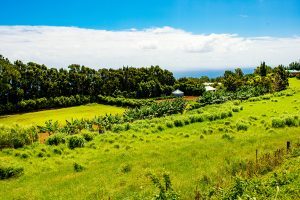 A new intentional residential community is being developed along the Hamakua Coast in Laupahoehoe. Kuwili Lani is what’s known as an agrihood (agriculture neighborhood) – and it is the first of its kind on Hawai’i Island. If you are looking for Hawaii Island property for sale that offers a sustainable, off-grid lifestyle, then you definitely want to learn more about Kuwili Lani. Featuring 11 one-acre lots with stunning ocean views and countryside vistas, this new subdivision is an intentional community. What do terms like agrihood and intentional community mean? For starters, a great deal of careful thought and design has gone into every single aspect of environmentally friendly living in this community. The entire subdivision is designed to be mostly off grid using different types of renewable energy including solar power, as well as, featuring sustainable rain harvesting systems for outdoor water use. County water is available for all indoor water use via our private water system. The first home built within the neighborhood as an example home is being designed and built using the latest in green building practices. In addition to living off grid in Hawai’i (without sacrificing an ounce of style and comfort! ), residents of Kuwili Lani will enjoy a shared benefit of living in an agricultural neighborhood, or “agrihood,” where everyone is able (and encouraged) to grow their own food, as well as, share their own produce in a planned community food co-op. In fact, each new lot owner will be provided with an individual plot layout list describing in full detail how to best utilize each individual Kuwili Lani property to its maximum potential. Over 10 years of planning and consideration have gone into the creation of Kuwili Lani. Situated above Laupahoehoe, the ocean views here are spectacular. Each lot within the private gated community has been carefully designed to take maximum advantage of the incredible views. On a recent visit I could see whales swimming off shore, and a hawk soaring in the sky above. Underground utilities and renewable energy systems mean no unsightly wires and poles to block your views. There is also dedicated wi-fi with redundant power backup. And yet, you are just a mile from Laupahoehoe and 23 miles from Hilo, the third largest city in the state with an international airport, restaurants, shopping, dining, museums, and myriad cultural events. Kuwili Lani is truly the first sustainable community of its kind on Hawai’i Island. If you want to live a more environmentally friendly lifestyle, Kuwili Lani may be an ideal community for you. Contact Julie Keller of Hawai’i Life to learn more!